Remember the line about ‘wonderful’ wind power saving the Planet (from something or other)? No? It’s certainly not doing much for millions of air-borne critters that are being belted to Kingdom come. Here’s Ken Richard tallying up the carnage. And that’s just Canada. 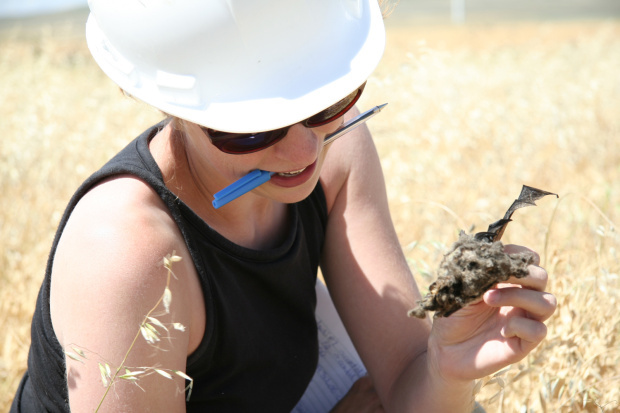 The Canadian wind turbine bat-killing rate is likely similar to the bat-killing rate in the United States, with some evidence suggesting the U.S. rate could be higher. 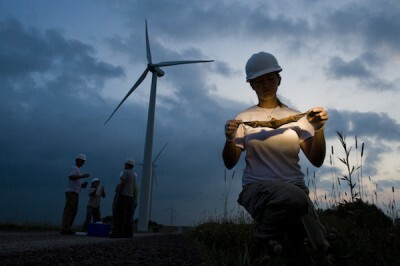 For example, Davila (2016) found that there were an average of 10.8 bat carcasses under each of the four Illinois wind turbines studied — over a span of just 20 weeks. An average of 10.8 bats killed per turbine in 20 weeks would extrapolate to an average of 28 bats slaughtered by each wind turbine per year — almost double the Canadian bat-killing rate. As of December, 2015, there were 48,500 wind turbines installed in the U.S. according to the Global Wind Energy Council (GWEC)1, up from 46,600 as of September, 2014 (Hutchins and Leopold, 2016)2. The U.S. will be installing tens of thousands more wind turbines in the coming decades to meet the U.S. Dept. of Energy goal that says 10% of supplied electrical energy must come from wind by 2020, 20% by 2030, and 35% by 20503. As of 2015, wind accounted for just 4.7% of supplied electrical energy in the U.S4. The share of electrical energy supplied by wind will therefore need to more than double in the next 5 years just to meet the first of the U.S. Dept. of Energy goals. Using the conservative determination of 15.5 bats killed per wind turbine (Zimmerling and Francis, 2016) described above, the 48,500 currently operating U.S. wind turbines are now slaughtering over 750,000 bats per year. This bat-killing rate appears to fall in line with other published estimates. For example, Hein and Schirmacher (2016) indicate that recent studies suggest U.S. wind turbines were slaughtering between 600,000 and 880,000 bats per year as of 2012. But this is just Canada and the U.S; there were only about 53,000 wind turbines installed in these two North American countries combined as of 2015. Worldwide, there are currently (2015) 314,0001 wind turbines spinning and slaughtering bats by the millions. Yes, by the millions … every year. Using the conservative average of 15.5 bats killed yearly by each wind turbine (Zimmerling and Francis, 2016), it can be estimated that there are now about 4.9 million bats slaughtered every year by the world’s 314,000 wind turbines. Even if the killing rate per individual wind turbine was generously reduced to ten bats killed per year instead of 15.5, wind turbine bat slaughter rates would still exceed 3 million per year. But a rough estimate of 3 to 5 million bats killed yearly by wind turbines is only the current rate. As of 2015, just 2.5% of electrical energy was supplied by wind worldwide1, 5. There are deliberate plans to have wind turbines “realistically” generate 18% to 34% of the world’s supplied electrical energy by 20505, 6. To achieve this massive expansion, installed wind capacity will need to double and triple and quadruple in the coming decades. The number of bats slaughtered by wind turbines could easily grow to a rate of more than10 million annually within ten to 15 years. At some point, there may not be enough species of bats left to kill. Bat species can be found dwelling in a wide variety of terrestrial habitats, including deserts and along sea coasts. Each species may play a fundamental role in its local ecosystem. For example, Kuntz et al. (2011)7 indicate that 528 different plant species rely on bat pollination and seed dispersal for sustainability. Boyles et al. (2011)8 estimated that by controlling pest populations (insects), the agricultural benefits of bats may reach $22.9 billion (U.S.D.) annually in the continental U.S. alone. According to the International Union for Conservation of Nature and Natural Resources, five species of bats have already been classified as extinct as of 2015, and another 172 species are listed as “critically endangered, endangered, or vulnerable” (Hoffmaster et al., 2016)9. 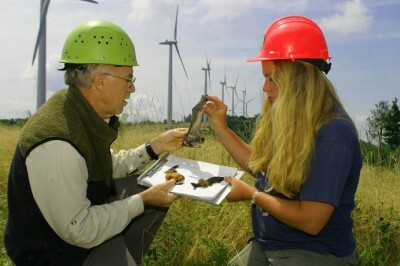 The prospect of losing bat species to wind turbine slaughter has increasingly become an acute topic in recently published scientific literature. For example, Hein and Schirmacher (2016) indicate that the current rate of wind turbine bat fatalities has become “unsustainable” for the already fragile maintenance of many of their species, and that actions to reduce wind turbine slaughter should be “implemented immediately”. Question: Do the immense costs of wind outweigh the tiny “benefits”? The primary reason why there has been such explosive growth in the use of wind turbines in the 21st century is, of course, because wind energy is expected to assume a fundamental role in the transition from fossil fuels to renewable energy in the coming decades. As mentioned above, world governments have recently (Paris Climate Conference, 2015) confirmed plans to rapidly expand their wind energy programs, which will presumably reduce CO2 emissions and, in turn, mitigate the amount of global warming we may have otherwise experienced had we continued using fossil fuels at current pace. But even if all the renewable energy transition planning (wind and solar primarily) were ambitiously implemented as recently professed by world governments, and even if these heavily pro-renewable energy policies remained in place through the year 2100, the total amount of global warming we may “save” the planet from may be less than two-tenths of a degree Celsius (0.17°C) over the next 85 years (Lomborg, 2016)10. This assumes, of course, that model-based assumptions about the climate’s high sensitivity to CO2 concentration changes are accurate. If these analyses are correct, installing an exponentially growing number of wind turbines may have no more than a negligible impact on the curtailment of projected global warming in the coming decades. Meanwhile, the long-term survival of the world’s already-threatened bat populations are directly and mortally impacted by government policies to add hundreds of thousands more wind turbines in the immediate future. At some point soon, the question must be asked: Are the climate “benefits” of wind power (theoretically mitigating global warming by perhaps hundredths of a degree) greater than the costs to the world’s ecosystems incurred by the wind turbine slaughtering of millions of bats every year? Or is there so little concern about the precarious fate of the world’s bat populations that it’s already too late to ask? In addition to being environmental disasters, wind turbines are also economic parasites. Their construction and maintenance costs always exceed the value of whatever power they produce. Since all economic costs can be traced back to some form of energy resource, this implies that the wind turbine industry consumes more energy from the general economy than they can ever produce. where you will find along with all the information about the inquiry all the submissions to the Senate Select Committee and transcripts of the public hearings as well as the Committee’s final Report. Checking out the Waubra Foundation website would also be useful. Information provided in submissions and at hearings is a great resource for anyone wanting to know what to expect if IWT’s are erected in their district. I signed it straight away. We are all in this together. I would suggest getting a leaflet printed and distributed to all homes, maybe repeated several times, pointing out all the downsides of wind turbines, besides noise, visual impact and bird/bat killing the economic case must be poor, the maintenance cost alone is probably more than the cost of diesel saved. The internet is great, but will only reach a minority, leaflets will reach more people, but renewable energy is a new religion, and wind turbines are its cathedrals, so you will need persistence. Good luck. Unfortunately the only way to wake some up is for them to accept these things only have one use – to destroy the environment for all. The other way to get them standing up and screaming is what has happened in South Australia – sudden damaging loss of electricity supply along with ever increasing price increases in the supply you do get and loss of jobs as industry and commerce leaves the State in droves. In wind-obsessed Spain (an obsession that has led to the literal destruction of their economy) between 6 and 18 million birds and bats are slaughtered each year, according to the Spanish Ornithological Society. Q: Where’s the outrage form ‘Green’ groups? Lord Howe island, which is a world heritage listed island is proposing the installation of two wind turbines. We have numerous endemic species of birds and bats but this doesn’t seem to matter! We are seeking any info or help from anyone to help spread the word to our 350 residents who are being bluffed by our local council. If there is anyone that has been effected personally by turbines. I would love to hear from you. I have even started a Facebook page. Say no to wind turbines on lord Howe island. Please like and share. Also download and read the attachments. She probably will, but I’d have to ask her She had to leave home because the dam infrasound affected her health. I’ll pose your question to her to get her answer. I’ll find your FB page and message you with my email address so that we can communicate directly. Lord Howe Island is not very big – I looked it up on Google Earth. If any resident is sensitive to infrasound, they will not be able to get away from the problem noise without leaving the island.